Until the early part of 2013 Vester Koza was an unknown quantity. In February though, he began to trickle releases via his Maslo label that has quickly established him as a producer to watch; his blend of understated, dubbed out house and techno hitting all the right notes. Cuts like “The Way (of the Dub)” proved to be cerebral yet functional on the dance floor as well, and this is an aesthetic he’s carried through to his most recent output, an untitled two tracker again on the Maslo label. His eye for detail, which has imbued his tracks with a refined, accomplished touch also extends to the label artwork, giving the impression that Mr. Koza is taking his time to construct an engaging body of work rather than pumping out tracks for the sake of it. With little known about the London producer, LWE went in search of one of 2013’s most promising new arrivals to get the low-down on the method behind his work. He also mixed together our 185th exclusive podcast which is a mesmerizing, deeply submersive experience in late night techno and house music. So you started releasing as Vester Koza this year. Are these your first releases? Any other pseudonyms? Vester Koza: Yes, these are my first releases. No other pseudonyms as yet. You’ve chosen the double hard-sell of being a new artist on a new label. Did you start your Maslo label to strengthen your overall identity or was it because other labels weren’t biting? Well yes, a bit of both really. I’ve been making music for years and always had liked the idea to do a label. And I had made a lot of music that I thought was OK, but I didn’t really know anyone or have friends in music because I just kind of disconnected myself from everyone in an attempt to focus fully on my music. I was never into sharing my music online, I was never into social networks before I started this year. So I’d never play my stuff to anyone, and I’m definitely not a very natural networker; but I was at the stage where I just felt like a bit of a lazy failure and at some point I just kind of snapped and decided I really had to push myself really hard to start promoting myself and getting people to listen to my music. So initially I was giving out CD demos for a long time at gigs, and yeah I never had much response, then I started on emails. When I eventually started to get good feedback from labels I respect but no offer of a deal I went the DIY route. The identity thing is definitely more important to me now than I had initially anticipated. Like this year, I’ve had interest from some really big labels and I was stubbornly telling them all to kind of piss off which was quite satisfying! But people were talking about advances and things so I decided I had to meet these people and at least have a chat. But yeah I’ve really grown into the identity thing with it as I think it’s important for an artist to maintain an identity without an attachment or without being compared to the rest of that label’s output. I think it’s getting harder for an artist to develop this as I feel as a lot of labels seem more focused in developing their own brand/presence as a label rather than developing an artist’s profile which is a shame as I think it’s very off-putting for an artist to join a label like this and there’s the danger that ultimately you just become a temporary tool in the label’s wider picture. There’s also something about the way things work in this day and age especially which makes it hard, like when you see how people run their Facebook pages. I don’t want my face to appear underneath some cheesy one liner designed to sell more t-shirts. I read all of these stories from people in the 90’s like the Warp guys who wanted to get out of contracts and start their own labels. I think it’s important that we as artists can learn from people stuck in these situations and use the tools available now to help us become more independent. Also, musically I’m totally not up up for compromising anything with anybody. I’m not up for having a discussion with anyone about which tracks they’d like to use or anything like this. The EP is the way I see it and that’s that, no way is anyone telling me what track goes where with my own music! But it’s a dilemma as I’d obviously like to reach people and it’s no coincidence that certain label releases end up in certain magazines. It seems like all that actually matters is that your music got validated by one of these labels and that’s what makes the difference for them in terms of covering you or not. So yeah it’s something that’s on the cards and I’m thinking hard about it at the moment and trying to work out the best way forward. So will Maslo continue to be solely for your own productions? I think so yes. I do have a close friend, and I’d like to release his music, but yeah he’s not been feeling ready and Maslo has become this thing now – this series of records and it seems cool to run with it. Unless anyone came to me with music that I loved and that artist was serious about things then I might open the label up. From the artwork through to your distribution, Maslo bears none of the marks of a fledgling or first time label. How much planning went in to Maslo? A lot of work went into getting funding initially, which took a few months to get through. I spent a long time developing the design concept and packaging. I knew I never wanted a big Maslo logo; I’m really kind of anti-branding. I wanted it to be more driven by art. My girlfriend is an artist and luckily she had ideas for the 02 and 03. The 1st one is a photo I took that has a lot of history and meaning in it for me. I thought it would be cool to leave it open so that each record would be different artwork wise as it is with the music. Distribution wise, I was focused on having my records cut at Dubplates and I had some DNP distributed records from labels like Mikrodisko, Recreation etc so I always had it in mind to contact those guys, and of course keeping everything in Berlin makes it simpler and gives me an excuse to visit! They are extremely professional, very nice to work with, supportive of what I want to do musically, get my records into shops all over the world and have helped me out a lot in numerous ways. Like, I pressed only 300 01’s to begin with and they sold out within a few days. I’m totally happy to keep repressing things; as long as people want to buy my music I think the least we can do is supply it. Do you have other skills or a career that has helped you navigate through this process of running a label and getting everything together? Career?! No. I spent too many years in music college, and within that we studied lots of music business related stuff that gave me an overall idea of how things work. I guess the most useful was the promotion, timing concepts – though today’s world is totally different. We didn’t get taught that a good way to promote your album would be to chuck a cream pie in someone’s face and post it on Facebook! And anyway, it’s basically impossible to utilize this knowledge fully when working on yourself. Like I know as the label I need to submit better press pics if I want magazines to cover it, but as the artist I really don’t want my picture taken ya know! What were you doing before Vester Koza? Have you always been involved in music? Yeah basically. Well I did very rubbish jobs after leaving school for a few years, but I was always playing on the decks, driving around to house parties, doing lots of drugs for years. Then I decided to go to music college and uni and did various work with music things here and there, a bit of club promoting. Then I started teaching part time in a music college and eventually did a PGCE. Where do the names Vester Koza and Maslo come from? I think to be honest it doesn’t really matter much where they come from. There is definitely a story behind each of them. Vester Koza is something I’m close to daily and Maslo is something that means a lot to me, but shouldn’t really mean that much to you and that’s what I wanted. I chose them as they are kind of abstract. They don’t hold any other meanings, at least in the English language, and I like that. That’s what I want. They mean Vester Koza and Maslo and that’s all. How long had you been working on the material that has made up your 3 EPs? Overall I think the first two were compiled from music I had written over the space of about 12-18 months. The third was much closer together like within three months. After that I listen to things for ages. I have to sit back and listen to things a lot to really understand them afterwards. I’m trying to be more decisive now and try to recognize that feeling of sureness in something. Like usually I know when I like something as soon as I’ve finished it. But i’ll still play it every day and think about it a lot. I don’t go and change things; I just need to understand it. Then I either put it in a certain playlist or bin it. More significant actually is perhaps the time difference between the 01/02 and the 03 which was about two years difference. Those 7 tracks on the 01 02 are very old to me now and I felt like I was trapping myself in a place in the past that I couldn’t get out of, should I continue to release music I wrote over that period. Even after I’d finished them and eventually got my head around them, which was at least a year, I then went out demoing them for months, went on business courses to get funding, had the records made. They were over 2 years old by the time they came out, and whilst I’m proud of them still, I was really itching to move forward which is why I fast forwarded to this 03 which I wrote last year, as I just wanted to bring things up to speed a little bit more. All of your releases so far have been mastered at Dubplates & Mastering. How important do you see that process as and do you think it’s important to always work with the same masterer? It’s extremely important. Dubplates and Mastering were the only choice I was ever going to make. So many of my favorite records were made there over the years and it’s striking and no coincidence how many of my favorite records continue to be made there now. Helmut is a very big part of the Vester Koza sound. When I first visited them I sat down with him and we discussed what I’d like to achieve with the music. I realized from the start I needed someone very delicate to work with on this. With my music I’m working on ideas I had about sound, unusual ways of doing things, inspired by other artists working in these kind of wrong ways, and unlearning classic production techniques which I was taught. First time I walked in there he gave me a consultation and we talked at length about the best way to approach things. He asks me do I like this, do I like that? In working with him over time I am improving and this third record I feel like I was able to get as close to a sound as I wanted to achieve as by learning what and how things sound in that room and what they can do to it. He also advised me about cutting records and what is optimum run times and with the second record he even advised me to drop a track to achieve better sound. I basically said I agree but, musically it was about the EP and the way the tracks work together, and he said that’s a very good reason to keep it! He advised me for the 03 to bring two tracks, one cut per side at around six minutes each and that’s what I did and I think it sounds great. What can you tell us about the mix that you’ve put together for us? Well, it’s probably not a showcase of what I’d do peak time in a club usually, but then I don’t think a podcast should be about that. I want my podcasts to be kind of special. I see them as another opportunity to do something creative and not a calling card to get DJ gigs. That’s the problem I’ve had in my head all year. I’ve had lots of podcast offers and I’ve been wrestling with it trying to figure out the best way to combine the two disciplines, because they are completely different things — DJing and production. The problem is I worked for years trying to come up with this Vester Koza production sound or identity if you like and I have to work very hard on it every day, really trying to develop things, and I get a bit worried that for some people, that mostly just download podcasts and free mixes from the internet, it says Vester Koza on it, and they start to associate that sound with my name rather than my own music. So because of this as I tried to develop my DJ sound, started digging hard, working on various mixes throughout the year that I never submitted for anything, I just worked on various things. And throughout this time I constantly felt conflict with my DJ sound and how it related to my production sound. So I would get hung up on it, like this mix must define me – it must showcase the entire Vester Koza sound, but how can it? And how can I achieve this with other people’s house and techno music? As a DJ you only have what’s been made to work with, but as a producer I might only really like this bass line or this kick drum, ya know! So I’d just play the whole track anyway, just focused on the kick drum and then I realize that’s not how to do things. You can see how Richie Hawtin and Dubfire got the way they did with their total reconstruction approach kind of thing! It’s basically what happens I think to a lot of people and ultimately it’s a bit of a problem I suppose, because if you can’t just enjoy music for what it is then that’s very sad, but as DJs we have to look at music this way, as parts that make a composition and sometimes the parts we have in our hands might not be making the picture that we’d choose to make for ourselves in our own music maybe. But most important is to just play music you enjoy I think and concentrate on making this new long piece of music and that’s what’s unique and where the creativity comes into it I think now anyway. So yeah about the mix! I guess I’m mostly trying to make something that’s a bit of a trip. It has a sort of ambient edge, though the club element is still very strong and the music is intense and kind of driving in this way. I think I will always want to, in some way do the kind of classic DJ thing and build up quite linearly with more gradually building tracks, but I’m also having a play around with the format to whatever extent. Like here, I found it was more cool to keep reigning it back in and showing restraint rather than letting things loose and building up. I’d try using more contrasting pieces that carried the same kind of atmospheres, textures and energy as the previous more driving tracks but were less pumping, more sparse or different rhythmically. So it feels a lot more like a subdued mix perhaps in places, on the surface initially, but I think there is enough energy in it to feel like it’s driving through still. It features some music by producers that I’ve been getting into recently, and also some music that I’ve come across whilst digging for music that has an interesting edge or sounds fresh to me right now. There is stuff in there by people like Jason Williams who made music as Velocette in the 90s and a couple of things on Sahko which I’m really into and a track by a band called Autumn who recently got an album re-issued by Minimal Wave, which was great, but there is an old album they did which I prefer, and this track from that closes the mix really nicely I think. I was also recently totally inspired by a mix that Lee Gamble did around his Mutek festival show for a Canadian radio station. It was kind of beat-less in places but it just had all of this energy about it that and there is this kind of broken weirdness edge to everything. Also I remember hearing about a Donato Dozzy set at Panorama Bar, I think it was on the Resident Advisor Exchange and they were saying how he built with ambient tracks but the room was completely swaying and people were really going for the energy in it and dancing like crazy. I would love to see something like this on my Saturday night! I don’t need a bunch of cues to tell me when the drops coming or that I should start dancing again now. I’d much rather get off on this wonky hi-hat for 10 minutes. 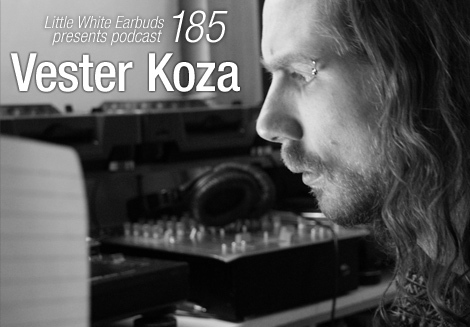 What can we expect from Vester Koza over the next year? Well I’m back to working on things again every day after a bit of a weird year adjusting. I’m very inspired at the moment. I’m really challenging myself, exploring and trying to develop, learn and then un-learn kind of thing. I’m listening to a lot of old producers work from the 90s. Very kind of solid type straight house and techno producers I guess and I’m forcing myself to try and work like I imagine they worked, only with what I have around me, then I try and scrap it all and come back and reassemble it using more modern techniques and just rewrite it into something new. Like, I’ll spend a few weeks trying these things out; I only use the PC to send midi and record it down. All of my FX processing, EQ and things I do on outboard. I can understand how people can think these things are subtle, but for me the sound of an old digital sampler, analog EQ , these things aren’t subtle, they are sitting there at the front, defining the character of the music. So yeah, this is what I’m working on at the moment. Figuring these things out by ear, experimentation, and guessing along the way is just what I enjoy. Though it’s important for me with these influences for them to become only that. A slight spark of inspiration, something to think about. Fundamentally I need to create my own character. I’m still developing with it at the moment. But yeah that’s what I’m looking for, a development on the character. The next phase I guess somehow. Lovely, looking forward to this. This guy is a real talent. I´m a big fan of all three releases so far, they will be in my bag for a long time! I picked up his 03 record in Phonica the other day. Was waiting for an instore by Huerco S, they were packing everything away and weren’t handing out any records, someone had left this in the spot by one of the decks I liked the artwork and just gave it a play. Had never heard of the guy but had to have it there and then. He seems to be getting some love now which is cool. Lovely music. fantastic mix! you rarely hear this sound nowadays..